PRC releases September 2014 Medical Technologist Board Exam Results (list of passers, top 10, performance of schools) - Balita Boss! The Professional Regulation Commission or the PRC released the September 2014 Medical Technologist (MedTech) Licensure Examination results. The official results were released on Wednesday, September 17, 2014. The examination was conducted by the PRC on September 13 and 14, 2014 in the cities of Manila, Baguio, Cebu, Davao and Iloilo. A total of 2,986 out of 3,615 examinees passed the September 2014 Medical Technologist Board Exam, according to PRC (via PRC Website). View or download the performance of schools in the September 2014 Medical Technologist Licensure Examination at prc.gov.ph. 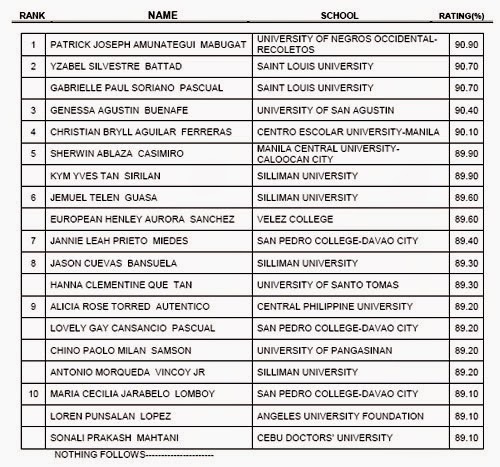 UNIVERSITY OF NEGROS OCCIDENTAL - RECOLETOS graduate PATRICK JOSEPH AMUNATEGUI MABUGAT topped the September 2014 Medical Technologist Board Exam with a passing rate of 90.90 percent. The Board of Medical Technology who administered the September 2014 Medical Technologist Board Exam were Dr. Marietta C. Baccay as Chairman, with members namely Ms. Marilyn R. Atienza and Ms. Marian M. Tantingco. Registration for the issuance of Professional Identification Card (ID) and Certificate of Registration will be on September 29 & 30, 2014. The date and venue for the oathtaking ceremony of the new successful examinees in the September 2014 Medical Technologist Licensure Examination will be announced later, the PRC said. Medical Technologist board exam covers the following subjects: clinical chemistry, microbiology and parasitology, clinical microscopy, hematology, blood banking and serology, histopathologic techniques and medical technology laws and related laws. In March 2014 MedTech Licensure Exam, a total of 885 out of 1,252 successfully passed the Medical Technologist Board Exam. Erika Jiline M. Jamandre of University of San Agustin topped the March 2014 exam with a score of 90.80 percent. Thank you for reading. Please follow Balita Boss? on Facebook, on Twitter or on Google+ to receive updated information about the Medical Technologist Licensure Examination.